A pod of dolphins in the Caicos Banks near Providenciales. A pod of dolphins in the Turks and Caicos. The incredible marine environment of the Turks and Caicos supports a menagerie of species, and one of most sought after underwater snorkelling sightings that visitors have here is of these friendly marine mammals. Atlantic bottle nose dolphins (Tursiops truncatus) are the most common type of dolphin in the Turks and Caicos, yet the Atlantic spotted dolphin (Stenella frontalis) is also seen in the islands. The Turks and Caicos fortunately does not have any captive dolphin “attractions”. All encounters take place in the wild, in the dolphin’s natural habitat. 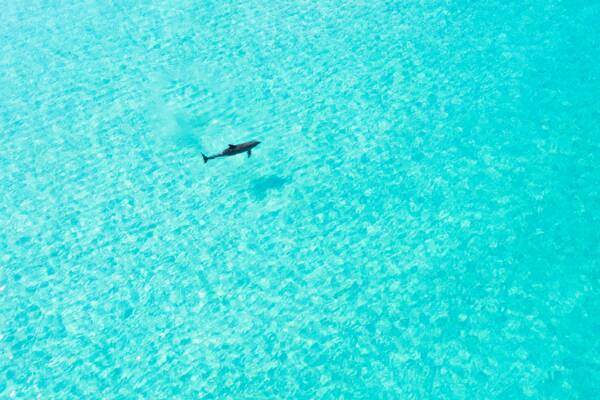 There are also no scheduled boat charters or tours in the Turks and Caicos that specifically have dolphin encounters. Any dolphin sightings that happen are simply a chance occurrence. Generally, dolphin sightings in the Turks and Caicos tend to either be small pod sightings, or of the famous Jojo the Dolphin, which frequents the waters between Grace Bay and Pine Cay. Dolphin pods may be seen almost anywhere around the Turks and Caicos other than the most shallow sections Caicos Banks. Typically, sightings happen in the Caicos Banks near Providenciales and North Caicos, off of Grace Bay and the cays between Providenciales and North Caicos, and outside the barrier reef off of Providenciales, simply because that’s where most boat traffic is. Dolphin pods around the Turks and Caicos tend to be between 5 and 10 dolphins, and there’s usually one or two babies or juveniles in the group! Jojo the Dolphin is a unique Atlantic Bottle Nose Dolphin that voluntarily interacts with people. In the 1980s, this friendly and wild dolphin became famous when he would follow vessels operating in Grace Bay. He was declared a natural treasure in 1989, and is still often seen in the waters of Grace Bay, or off the cays between Providenciales and Parrot Cay. Jojo the Dolphin at Grace Bay. It’s common for visitors to the Turks and Caicos to want to take a boat charter specifically to see dolphins. Unfortunately, sightings are never guaranteed, or even fairly predictable. The best you can do is stack the odds in your favour, and choose a company that visit the areas frequented by dolphins, and uses vessels that attract dolphins. 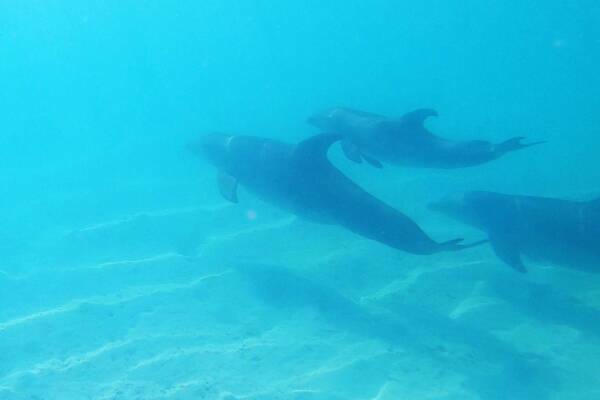 Dolphins are very intelligent creatures, and like to play. One setting they particularly like is a pronounced boat wake, such as the wake created by specialty wake surfing and wakeboarding vessels. Every type of boat makes a particular noise, and dolphins recognize and often flock to vessels they associate with a fun wake. One popular local water sports company, Wake to Wake, has an enviable reputation with dolphin encounters, as their incredible Instagram account can attest to. Leading eco-tour company Big Blue Collective has pioneered low-impact adventures to incredible locations throughout the Turks and Caicos, and has one of the best reputations for snorkelling encounters with dolphins and humpback whales. Big Blue goes out of the way to visits some of the most amazing spots in our islands, from the exquisite West Caicos, to hidden and remote gems such as West Sand Spit and Fish Cay. Another common setting for encountering dolphins are the scuba dive boat trips from Providenciales to the exceptional dive sites on the southern and western sides of the Caicos archipelago. Amazing dive sites are located near French Cay, West Caicos, Sand Bore Channel, and Northwest Point, and many divers find the one hour boat transits out to be well worth the price of admission. The larger dive boats, such as those used by Dive Provo, create a decent bow wave, and it’s not uncommon to come across dolphins in the Caicos Banks who will play in the wake for a few minutes. It’s important to follow established guidelines when swimming with dolphins and other marine mammals in the Turks and Caicos. Wildlife is unpredictable and can be dangerous. Dolphins should not be touched or fed. Do not chase or harass dolphins, either when swimming or with vessels. They’ll often approach on their own if they’re interested. It’s common to see baby or juvenile dolphins. Don’t chase, approach, or get between the calf and the other dolphins.